Born in 1950 in the Arat Kilo district of Addis Ababa, Wosene Worke Kosrof is a contemporary artist who has achieved international acclaim. Formally trained at the Addis Ababa School of Fine Arts, he completed a BFA with distinction in 1972. Then, as a Ford Foundation Talent Scholar, he was awarded an MFA in 1980 from Howard University in Washington, DC. 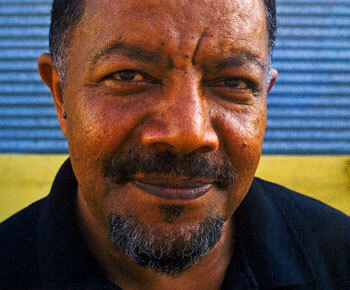 Over the past four decades, Wosene (his professional name) has created an internationally recognized artistic signature in his work by being the first contemporary Ethiopian-born artist to use the script forms – fiedel – of his native Amharic as a core element in his paintings and sculptures. This recognizable ‘signature’ emerges from the way he elongates, distorts, dissects and reassembles Amharic symbols – not as literal words – but as images that speak for themselves in a visual language accessible to international audiences. Jazz improvisations underlie his compositions, animating them with rhythmic movements and emboldening his masterful use of color. The very nature of Wosene’s work – his visual vocabulary, his ‘mapping’ of cultures across time and place, his sensual use of form and color – testifies to the visual power and versatility of language. “I create a visible, interactive surface – like visual icons that are accessible to everyone. My paintings invite viewers to dialogue with them, to take them into their memory.” A major aspect of Wosene’s works is that they present us with a challenge to look into the art, feel its effect, and to watch what happens. He paints from a place between mastery and uncertainty – and so the viewer too can approach his work to discover meanings that emerge through interaction. 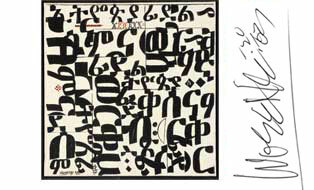 I am the first Ethiopian-born painter to transform Amharic script into contemporary abstract art, and these script-images have now become recognized internationally as my ‘artistic signature.’ Amharic, derived from the ancient language Ge’ez and a major modern language of Ethiopia, is one of the few written systems indigenous to Africa. Though Ethiopia has centuries-old traditions of two-dimensional art that include script, such as Coptic icon paintings underscored by written narratives, the script symbols themselves were never developed as a fine art form. During the past thirty-five years, I’ve produced five major series of paintings in which I have defined an ‘aesthetics of script’: Graffiti Magic (1980-1987); Africa: The New Alphabet (1988-1994); Color of Words (1995-2003); Words: From Spoken to Seen (2004-2008); and, in my current series WordPlay (2009-present), painting has become an intense process of ‘dialoguing’ with the script images, exploring the versatility and playfulness of their surfaces and interiors, dissecting their ‘skeletal’ structures, observing the ways they move, interact, and intersect. I elongate, distort, invert, dissect, and recombine their shapes and volumes, and turn them inside out to discover their moods, tempers, and personalities. On canvas, the script images are divested of their literal meanings to become gesture, dance, music, movement, and stories of the human drama. I don’t pre-sketch paintings; my process is inchoate and exploratory: the interplay of accident and intention, of mastery and uncertainty, of curiosity and discovery. Quick-drying acrylics allow me to easily build and destroy colors and figures on canvas. I use a wide-ranging palette, from bold primary colors to muted tones that look almost repellent on my palette, but that smoothly integrate into a composition; to black and white paintings with bare touches of color; to works in several tones of a single color. Since my student years at the School of Fine Art in Addis Ababa (1967-1972), American jazz has asserted a significant influence on my painting. Like jazz music, the script provides a repertoire of dense, yet supple, elements that lend themselves well to visual improvisation. Jazz also influences my sense of composition: like improvisational music, the language symbols can be juxtaposed on canvas in nonverbal ‘word-plays’ to create a visual language of form and color, rhythm and movement.